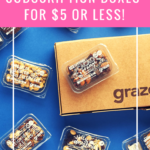 Surprise My Pet is a monthly subscription box for dogs. Surprise My Pet customizes your box to your dog’s size. Choose tiny (less than 10 pounds), small (10-20 pounds), medium (20-50 pounds), or large (50+ pounds). This is a review of the “large” box (my dog, Nyx, weighs 90 pounds). The box was pretty big and seemed full when I picked it up off my doorstep. Always a good sign! In fact, it was difficult to take a picture that showed all the contents. There was a lot in here. The Cost: $39 per month on a month-to-month plan, with better deals for longer subscriptions. Shipping is free for all plans. COUPON: Save 5% off your first month with code ADDICTION. 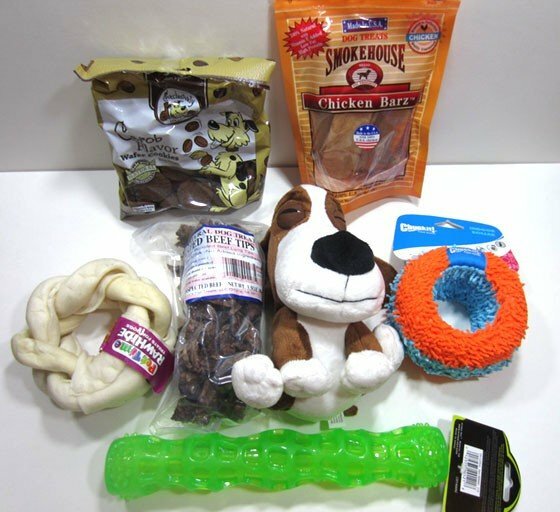 The Products: 4-7 toys, treats, chews, and other goodies for dogs. I didn’t notice a theme for the month, but the box did include a card listing the box contents and retail prices. Some of the retail prices listed on the card seemed high compared to what I could find the products selling for online, but the differences weren’t huge. This didn’t have a brand name listed on it so I am again using the price provided on the information card. I haven’t given it to Nyx yet (I only give her one new toy every few days) although I suspect she’ll have the ears off in minutes and the squeaker extracted shortly thereafter. Nyx liked the Chuckit toy. She pulled some of the coating off after an hour or two, but she is the most destructive dog (when it comes to toys) that I’ve ever had. I like the yarn covering because I have a curio cabinet in my living room and I’m always afraid a thrown toy is going to hit it and break the glass. A softer coating like the Chuckit toy makes it safer to throw inside! Both of these treats are made in the USA, which is the first thing I look for with new treats. The Chicken Barz have a really simple ingredients list: chicken and vitamin E! I love it when pet treats don’t have a lot of filler. Nyx is still doing her food trial for allergies, though, so I can’t tell you what she thinks of these yet. Luckily, there are a lot of large dogs in my extended family so someone will get to enjoy them soon. Verdict: I calculated a value of $52.76 for the April 2015 Surprise My Pet box. That’s actually a pretty good value for a pet box, even if you subtract the rawhide from China. I think the sizes of the toys are appropriate even for a dog as large as mine. (As many MSA readers have pointed out in the past, there is a big difference between a 50 pound dog and a 90 or 100 pound dog.) The toys were of varying durability, but Nyx is particularly destructive – these would’ve lasted forever with my last Rottweiler. It all depends on the dog. Overall, I’m satisfied with the value and the mix of toys and treats. Although the rawhide wasn’t a hit, there were a lot of other items that worked for us. From what I can tell, this is a fairly new subscription and I’ll be interested to see how it develops in the coming months. A couple of final notes: (1) I contacted customer service by e-mail with a question and they got back to me in a few minutes, which is great. (2) If there is a time that some item in your box is completely ignored by your dog, Surprise My Pet has a guarantee and is willing to work with you to make sure you’re satisfied. What do you think of the April 2015 Surprise My Pet box? Do you subscribe to any dog boxes? I was going to go to barkbox but thought I’d give this a try WRONG. I went through Groupon first mistake they screwed up, tried to contact got a email back saying I’d have to deal with SMP. I will say customer service was great and SMP straightened it out. I’m disappointed in the quality, Jack is a 65 pound pit bull ok to be fair except for KONG and tires he definitely chews them up. Did I say he is 65 LBS and a pit? So the box arrives and had a candy bar, popcorn bag 4 quarter size treats 2 in 2 bags a cloth squeaky bone and felt type sandwich with velcro. Going to cancel and go to BB. Sorry just not worth the money. I’ve considered moving from BarkBox to another when our sub runs out. Looks like this could be a good one for our Zeus (75 pounds of goofy love). BTW, LOVE your Rottweiler! I grew up with them, such a great breed. What a beautiful girl! I hope Her allergies get figured out soon! The “plush dog” doesnt look like materials that I would trust to be pet safe. the rest i have literally seen/gotten from TJ Maxx (my pup loves his roller from there). So glad to see a large dog box review!!! I have a 52 lb pittie and she thinks every toy is meant to be destroyed as soon as possible. I tried BarkBox a couple years ago, but kept getting inappropriate toys and treats made with peanut butter (she can’t eat it) so I cancelled. She would have LOVED this box (I do find it entertaining to watch her kill a stuffed animal in minutes bc she’s very dramatic about unstuffing them and finding the squeaker – which she always proudly gives to me), in fact I’m going to look for that indoor roller on Amazon or at PetSmart! Nyx never gives me the squeakers. I have to fish them out of her mouth. When I can pry her mouth open. Rotties have strong jaws. I have to pry pieces of sticks, chicken bones she finds on the sidewalk (we live in downtown Chicago lol), tennis ball fragments etc out of her mouth – I know the struggle!!! Appreciate the quick response and the apology and the reiteration of their policy, but I am not sure why they would have these items around if they weren’t intended to be sent out. Although, looking at past reviews on other sites, it seems like they are going through some changes (in price, type of items offered, etc.). I have seen rawhide from the same company in reviews of previous boxes so maybe the “no treats or snacks from China” policy is new? Certainly, the three bags of treats were made in the US. I would love for Liz to review this box as well, Im curious if a smaller dog size would get the same great variety in toys and treats! Love gratuitous pet pics! This was a really great box, my pup can also destroy toys at an alarming rate. We have a collection of eyeballs because that is always one of the first things to go. (plastic, or embroidered, doesn’t matter) I think she would enjoy those toys and treats and it seems like a really good value compared to other boxes. So nice to finally read so review got a large breed dog box. All of the barkbox reviews I read are for small dogs. I have A 150ish lb St. Bernard who is ambivalent with toys except tug ropes, a red dobie who is about 100lb and is right there with your pup-the most toy destructive dog, and a small breed mix. I am thinking about trying this box…while most would be destroyed quickly, the treats look quality and are $10-15ish ea at the pet store. I also refrain from china items. So so so much agree — so happy to finally have reviews from someone who has a genuine large dog! I’ve got a 65lb lab-rottie and she’s small but VERY destructive with toys. She has murdered every Bark Box toy we’ve received within an hour. This box is an incredible value and great for a large breed dog so we will switch over to this when Bark Box ends. Thanks again!! Hilton, I also have a very large dog. Unfortunately, he’s quite clever and can manage to get out of his kennel. I’m wondering, do you kennel your dog’s? If so, what kind of kennel do you use? im interested as well to see what they say about the raw hide as well. I had a dog with severe allergies to grass and trees. It’s not always food!!! After a year I took him to a veterinary dermatologist and he was properly diagnosed. I gave him allergy shots for several years. Good luck and keep trying!! Agree it’s not always food — one of my cats has asthma attacks every March, which is almost certainly something environmental. (Luckily I always have the medication on hand to treat that at the first sign of trouble.) In Nyx’s case, the symptoms were definitely centered on the digestive tract (I won’t go into any more details). Did you ask support about the rawhide from China? I’d be curious about their response, since they sound very responsive and support focused. I can send them an e-mail. OMG Your little girl looks like my Mini Pin Lily!!! Gorgeous!!!! She’s actually a Rottweiler. It always amazes me how many different sizes and breeds of dogs have this same color pattern on their coats!